Powered by Wilmington Healthcare data with Binley's heritage, Binleysonline is a subscription based resource that provides a unique 360º view of the national and local UK healthcare market. 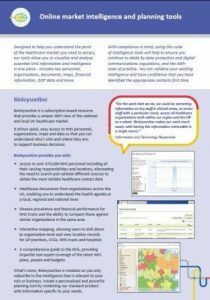 It allows quick, easy access to NHS personnel, organisations, maps and data so that you can understand who's who and where they are, to support business decisions. Create a personalised and powerful planning tool by combining our standard product with information specific to your needs. Incorporate additional Wilmington Healthcare data (and/or add your own data), and the people, places, maps and analytics you see on Binleysonline will be tailored for your business. Binleysonline is for reference purposes only. If you are interested in compiling a mailing list or any other type of database, please consult our range of contacts databases.